Welcome to another weekly challenge with the Paper Craft Crew! I started by using the 2 1/2″ Circle Punch (retired) to punch a circle from Whisper White cardstock. I then took the leaf image, and used sponge daubers to ink it with Old Olive ink in the middle, then Mint Macaron ink blended on the outer edges. 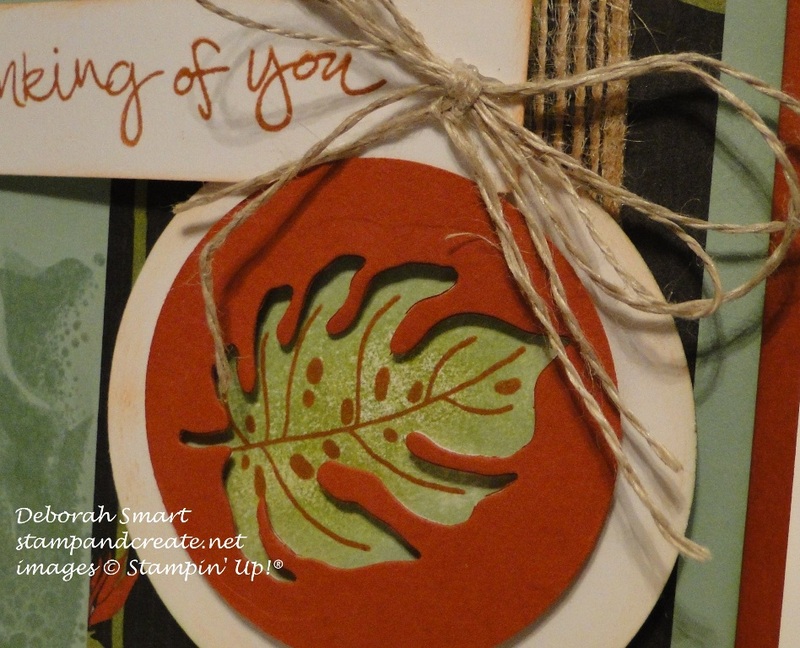 I then stamped it onto the Whisper White circle, then added the leaf veins in Cajun Craze ink. I then used the coordinating framelit from the Botanical Builders Framelits, and die cut the leaf from a 2″ Circle of Cajun Craze cardstock. I attached this circle on top of the stamped image using Stampin’ Dimensionals. I added a strip of the retired Botanical Gardens DSP to a panel of Mint Macaron cardstock, and added a piece of the new 5/8″ Burlap Ribbon down the right edge. I love the loose weave of this new Burlap Ribbon – it gives it such a lighter look! I masked off the DSP strip, and inked up the leaf image in Mint Macaron ink, and stamped it several times down the left side of the paper, on the cardstock. The sentiment, from the Sheltering Tree stamp set, was stamped in Cajun Craze ink onto Whisper White cardstock, and the edges were sponged with the ink as well, using a Dauber. I attached everything to the Cajun Craze card base, then added a triple bow, tied in the Linen Thread, and attached using a Glue Dot. I hope you enjoyed seeing my inspiration for this week’s sketch – please head over to the Paper Craft Crew blog to see what the rest of the Design Team have created! Then, link up your card for the challenge – I’d love to see your card there! If you’d like to order any of the products used for this card, you can click on my name below, and you’ll be directed to my online store. Very cute card, Deborah. I love how you used the negative of the leaf!